This entry was posted on March 3, 2012 at 10:32 am and is filed under co-ordinates, wardrobe planning. You can subscribe via RSS 2.0 feed to this post's comments. Both comments and pings are currently closed. I agree that Mccalls 6519 is a lovely wardrobe and when I saw it I thought how perfect it would be if it would suit me. 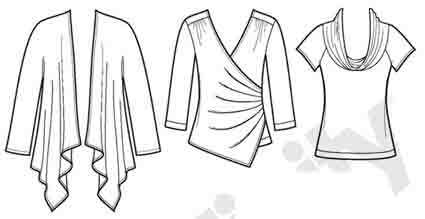 Wouldn’t it be wonderful to buy one pattern for your Spring wardrobe, collect your fabrics and get sewing? You say it should suit 50% of women. I’m not so sure. As you have demonstrated, everyone is so different! I love the skirt, top and dress, and I think those items would look good on me, but the jacket is too boxy for me with my wide shoulders and I don’t think the pants would suit me. And yes, the idea of one pattern which includes everything is a tempting simplification. I keep dreaming of it, but my wardrobe needs don’t fit very well with any of the wardrobe patterns. I mainly wear tunics and vests, not jackets. And different weights and sizes at different times of year. I’ve got my minimum number of different garment types down to 12. . .
M6519 is on my table right now, and I am gathering supplies to start with the dress. The collar in a jersey will be a challenge, but I shall try. I have some reservations about the width of the pants, as I am short and would have to wear high heels. 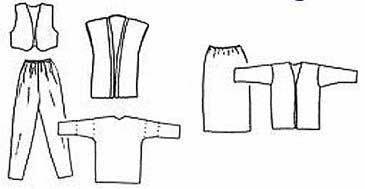 In general though, I think this wardrobe pattern could take me through a number of weeks. Good Luck with the collar Mary ! I don’t sew knits so can’t give tips, but I do sew a lot of samples when I’m uncertain of the results. . .
There’s about 9-1/2 inches of ease in those pants. 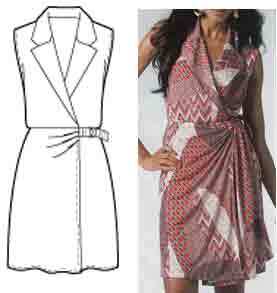 So you might fold out one of the pleats on both front and back – perhaps 1 to 1-1/2 inches removed down the length of each pattern piece. And still have a loose look to the style. Lisanne, thanks for links to my sew-along. I too have been looking at wardrobe patterns in a new light. I’m unlikely, I think, to make a wardrobe pattern now, having settled on so many of my own basics, but I am interested in how the basics are put together. 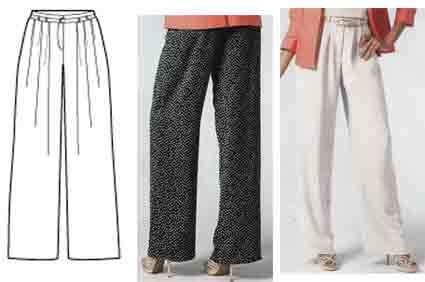 I think the small-scale print trousers in your example are very far from what I would wear though! I sometimes wonder why they do that? 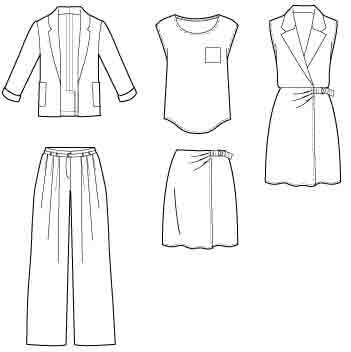 I’d put together jacket+trousers+skirt in dark blue; jacket+trousers in white, top and dress in linking prints. Maximum variety with seven pieces. A white top if you wanted even more variety. The first blue set makes two outer columns; the second white set makes one outer column, with a top also one inner column. The prints add variety. Add a necklace in blue and a necklace in red and maybe a white or white/blue scarf. 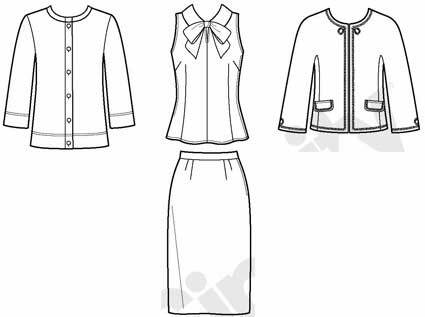 Good suggestion Elizabeth – though I think you need the extra top (McCall’s made 1 jacket, 2 tops and dress, 3 bottoms). And suggesting the accessories – I do wear scarves but not necklaces. I agree with you it’s best to develop my own basics. But I do enjoy looking at and thinking about wardrobe patterns. You know, I also stopped for a moment at the small scale print trousers. I always avoid prints (other than pinstripes) for pants for fear of looking like I am wearing pajamas – or for the office, looking far too casual. But looking at this picture has me also questioning that stance. 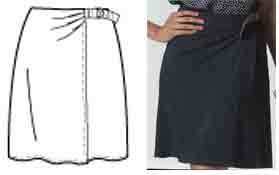 Thanks, sewingplums for making me see this in a whole new light! And ejvc, that is a brilliant, multi-season little capsule you mapped out there. Good timing. 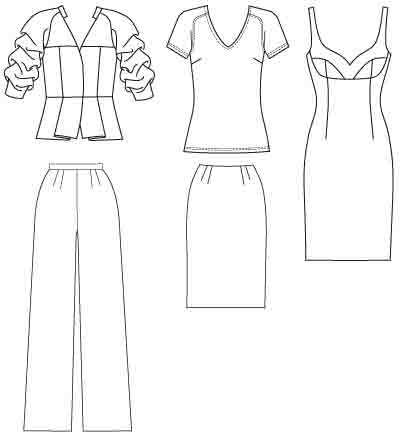 I was recently inspired by an article on Sew Inspirational and a wardrobe pattern (I can’t remember the number off the top of my head) I saw on one of the OOP sites. It was only for plus sizes and I am a certified runt. Now I am obsessed with wardrobe patterns in a whole new way; I save images of ones I would never buy or wear just for hints about coordinating colors and textures and do frequent blog searching for ideas from others (especially sewists) who are wardrobing/coordinating/capsuling. Another source of wardrobe inspiration. All the Won Ton blouse needs is a matching pair of pants or skirt and you have 2 interchangeable columns ala Nancy Nix-Rice. Not a true Core 4, but very versatile none-the-less.